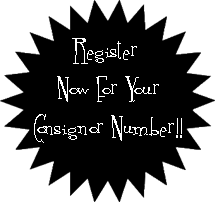 NEW CONSIGNORS MUST REGISTER FOR A NUMBER BY CLICKING ON THE REGISTER TAB. IF YOU CONSIGNED WITH US LAST YEAR, SIMPLY CLICK ON CONSIGNOR LOGIN TAB AND LOG IN. Come experience the best in 'gently-used' adult and children's clothing, shoes, nursery items, baby equipment, juvenile and adult bedding, household furniture, housewares, pictures, outside play equipment, books, software, dvd's, videos, and toys, toys, toys. We are very excited to offer families the opportunity to sell their unwanted items and purchase quality items for a fraction of the original price. Once you discover Re-Runs for Wee Ones, it will be an event your whole family will look forward to each season. We will see you at the sale! Organizer - Re-Runs for Wee Ones... and Adults, too!